Last Spring I made a long trip to the East. First I visited Thailand where my brother currently lives and works, I went to Cambodia to see the Angkor temples, then I passed on to Japan and I crossed the country by train from South to North. I was on the road for five weeks, I saw, heard, tasted and smelled many new things, some of them felt strangely familiar but not quite the same. The plastic chairs in Bangkok were a bit different from the ones back home, the cicadas in the Cambodian jungle sung a different song, fried fish in Japan had a different taste. In the beginning of the fifth week I reached Hokkaido, the northernmost of Japan’s main islands, and visited Jigokudani, or Hell’s Valley as it’s appropriately named because of hot steam vents, sulphurous streams and other intense volcanic activity it displays. The smell of sulphur was exactly the same as the one I remembered from Nisyros and for the first and only time during the trip I felt like home. I prepared the trip the way I’d prepare an art work. I made a list with references, materials and points of interest to my practice (the Erawan Shrine in Bangkok which houses the statue of the deity with the four faces that answers prayers and where a bomb exploited in 2015 killing and injuring many, the 1000 origami crane tribute at the Peace Memorial in Hiroshima and Nagasaki, the Usuki stone Buddhas carved from soft volcanic rock from nearby Mt Aso, the sun rising from the Pacific, etc.). I compared and combined train and plane itineraries, google maps forecasts, tripadvisor tips, booking.com offers, drew points, connected them together and laid out a route on a piece of paper. Then I set out to crosscheck it. But first, I went to Nissyros and worked on an in situ installation at the Sterna studio in Emporeios. I visited Nisyros for the first time in June 2015 when I was invited to participated in the project “at the Baths”. Since then, I come back on a regular basis both physically and metaphorically. Many of the materials and the obsessions I carry on to my work are routed here. The fat oak leaves that against the light look like vampire bats, the rattling cobbles, holy cows, soft pumice stone a bread knife can go through, yellow sulphur that eats away cotton fibre.. These are some of the things that planted the seed that brought me all the way to the far East. 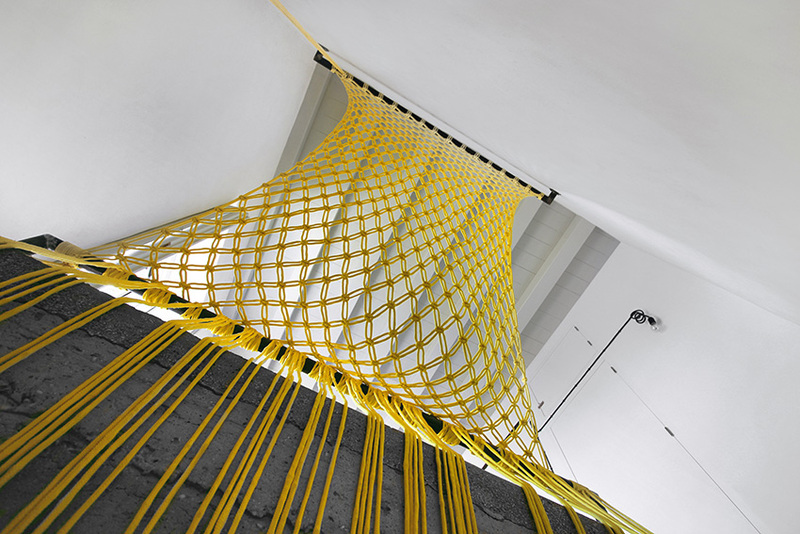 Same as every artwork, the installation at the studio was like a mathematical equation that had to be solved. 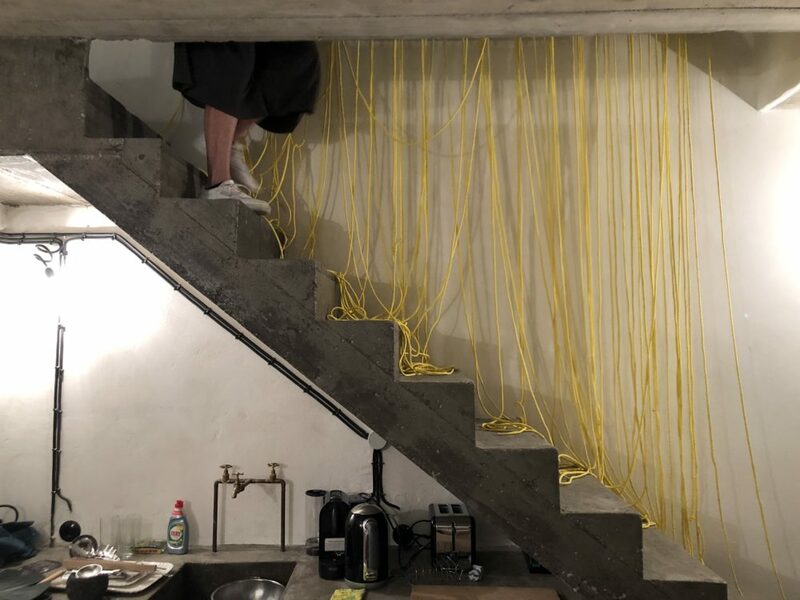 A molded cement staircase connects the ground floor to the bedroom upstairs creating an oblong gorge that disrupts the first floor. For security reasons, the border of the gorge had to be made visible. The studio is quite compact, the install had to have some practical use so as to add to not to take up more of the tight space. I also wanted to take under consideration the special geography of the location, the designated perpendicular gap is boxed in a structure that stands on the verge of the caldera. I thought of a sulphur-yellow hammock suspended over the hole over the volcano. I watched youtube tutorials demonstrating different weaves and ways to hang a hammock, I compared and combined and came up with a design. I work with youtube tutorials a lot lately, I’m interested in the act of copying, the connotations, symbolism and rules the practise has in relation to Eastern traditions and religions as opposed to the plurality, abundance and loose reliability of tips and treatments exchanged among the members of the world wide web. In this context, what can be thought of as original or attributed to personal expression. I chose a weave and practised it in front of the screen till I could do it by heart. I started weaving to see how it will come up and what it will look like made by my hands. I called the piece “Over the Volcano” a consistent but predictable title. Years ago, not long before I visited Nisyros for the first time, I made a piece I named “Under the Volcano”. I had a beautiful big crystal vase which slipped my hands and smashed on the black marble floor of the studio I had back then. The scattered crystals looked like the galaxy, I didn’t have the heart to throw them away so I swept them under my working bench. They stayed there for a long time. One day I was loitering around the studio, the sparkling glass under the bench caught my eye and I thought the arrangement can make a piece and immediately the title “Under the Volcano” came to mind -of course I was also referencing the popular book. When I decide to show the piece in public, instead of moving the actual bench to the gallery I made a 1:1 duplicate in cardboard and laid the crystals underneath. I suspect that -quite rightfully- whoever saw it probably thought the cardboard copy was the piece. But for me the gist of the piece was the broken vase swept underneath. Once, I was chatting with my teacher in NY about ways to make better use of space in the studio and she suggested that I should manage the room under the tables. I believe her advise was quite poetic committed to stuff that we cannot afford either to deal with or part with and we cramp and hide under the bed, under the table, under the staircase till further notice. 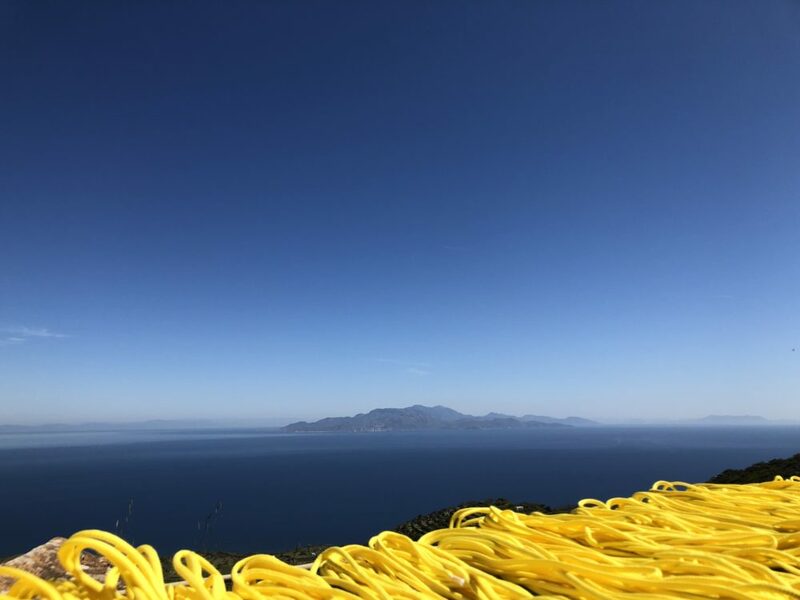 When I was given the opportunity to work on a permanent installation in a studio in Nisyros -and after having walked on the crater and heard and felt the core of the earth boiling under the skin- I considered it my task to reverse, at least formally, the process and bring something overhead. For a few days twice a year, if you watch the sunset from Chochlaki beach in Madraki, you will see the sun diving straight into the water. 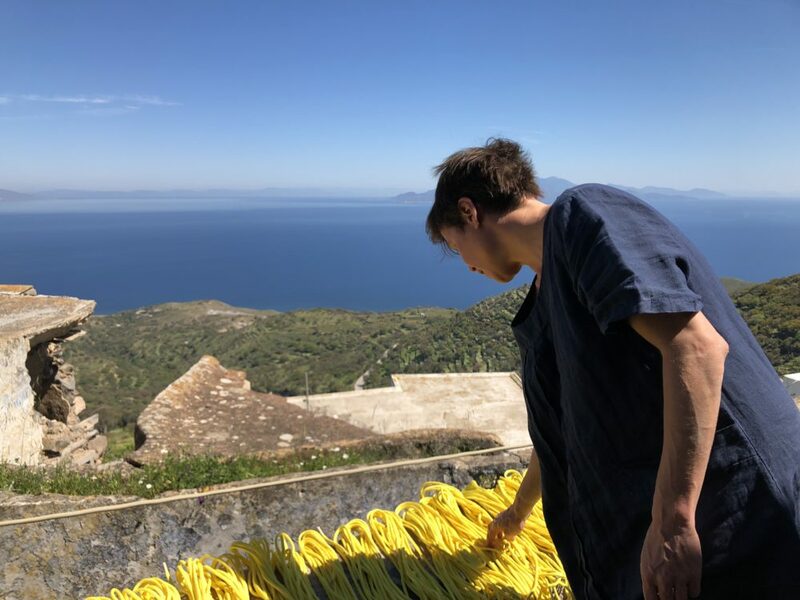 This year I visited Nisyros twice, first in early April before my long trip to prepare the piece in the studio, and again now, six months later, by the end of Summer. I was fortunate to catch the days the sun sets in the sea both times. In the past, I had shot pictures and video of these sunsets, reversed the footage and presented it as the sun rising from the Pacific. In May I was in Okinawa where I witnessed the sun rising from the Ocean for real. But before that, and again now, from the studio balcony in Emporeios I saw the sun rising behind the Datca peninsula behind which stretches the East.